I bought this loom for my daughter 4 years ago at Christmas. Suggested she use it to make gifts for friends and relatives since she had little money to buy Christmas gifts. This loom has helped her to realize that a home-made gift can mean more to a person than a store bought gift. The smile on her face, when they open her potholders, is worth every bit spent on this loom and more. My sister has washed her potholders several times and they hold up very well. Great gift and activity for kids!!! I'm 200% please with this purchase. I've also looked for the refill loops and Miles Kimball is the only supplier of cotton loops. The nylon loops don't work as well. I use these in the kitchen. I hold hot pots and pans. I also use them to protect my counter and table tops. Great for the old and the young. My 80 year old father made a bunch of pot holders for me along with my young grand children. The fact that it comes with a metal hook is a plus. I have a loom with a plastic hook that is too short to weave with. I would love to get a secong metal hook. no looking for pot holders now! my boys had a ball making gifts for everyone in the family, kept them busy for hours. well worth the purchase! this is the second set i've order, besides another bag. this product does not let your fingers get burned. my son won't use the others i have. so we like these potholdersbest. I would buy this product again!!!!!!! This is for my grand daughter for Christmas. I think she will enjoy it. 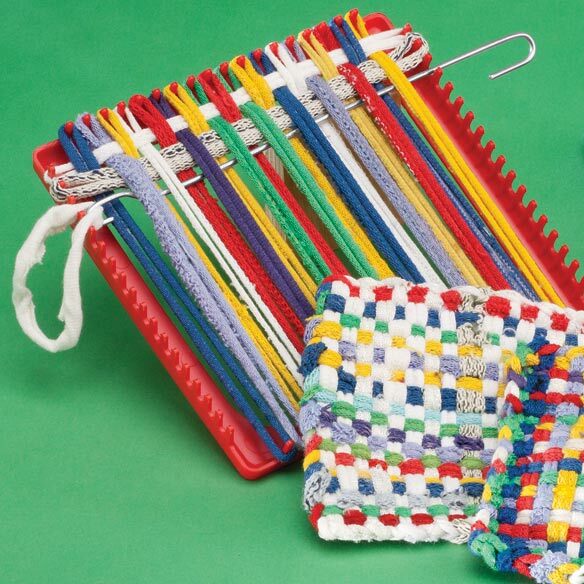 I had one of these as a child and enjoyed making pot holders. I had not seen one in years so when I saw this in my Miles Kimball catalog, I just had to order it as a gift for my grand daughter. I hope she enjoys it as much as I did so many years ago. I have decided in my old age that I need new pot holders & I should try and make some myself. My Daughter laughs at me. I believe it's because she did as a little girl. Whatever, I shall do it anyway. Thank you. These were a gift to our 4 children (aged 16-5)a couple years ago. We just finished them last week; had worked on them off & on. The result is a beautiful bathmat! We had enough to make 13 "potholders" and some loops left over. We will be ordering the refill--great fun! Some (maybe 2 dozen) loops didn't stretch enough, and some were frustratingly "close" and popped off the loom. But if one is careful they are workable and end up a nicely finished product. Oh, the ones that were too small were tied together and became a jump rope for my daughter!! 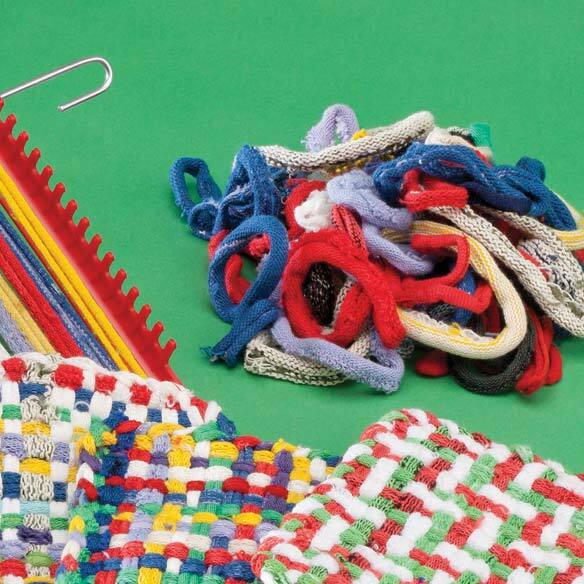 Enjoyed making these potholders, brings back alot of memories of childhood. I like this craft kit, however, the yarn colors are not pretty. They are rather gaudy. Better to learn with the kit yarn, then use your own. This product is for my grand daughters. The kids in school love them. They are a great introduction to weaving. Project that Grandma can teach, kids can do, and Mom can use. Fun to do with your grandchildren! 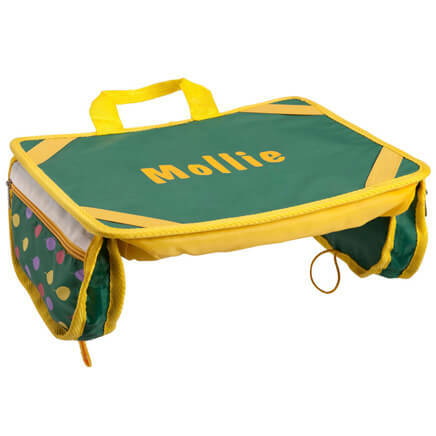 With more advanced directions, a child could create purses from the squares, even play costume vests. the loops do not stretch easy. the loops are too big they don't fit when you go to weave. Very disappointed in this product. Loom is plastic but seems sturdy enough - we'll see how long it lasts. However, the loops are pieces of old rags that are odd colors, variable thicknesses, loose threads everywhere, and many are too small to even fit across the loom! Not at all like the loops from years ago!! The loops do not strecth. The loops were very cheesy. Lots of the loops would not stretch to fit the loom. They were either too short or very fat or very thin! We had a lot of them! The pot holder would shrink after washing to about a 3 1/2" square! It's such a fun project for me and the kids but I'd recommend a better quality loop. These were cotton. I'm trying a different mfg. next time that uses Jersey material for their loops. Don't wast your money on this one. Pay extra for the a good quality loop, it's worth it. They were such a bargain. I couldn't pass them up. For my grandchildren who love arts and crafts. See above for the refill. Did these when I was a kid. Bought for my granddaughter. metal frame, reasonable cost, pay pal eligible. LIke to have hobbies on hand to share with grandson. Use to have one of these as a child and loved it. Going to take it up again! To start my granddaughter on crafting. I had one when I was a child. I ordered it for my granddaughter. Memories remembered and made. For my niece who is crafty & likes giving her crafts to others. They fit my grand-daughter's interests, and age. I had one of these as a kid. To teach my younger granddaughter to make pot holders. for great grand daughter. loves to do these. cannot find anywhere. I think my graddaughter will like them for her 11th Birthday in November. Remember these from my childhood. Granddaughter has been asking for this. I remember when I had this when I was growing up and it's very nice for little girls to learn a craft!! love making my own cradts and these are great and last longer than the ones u buy in the store. For a 7 yr old granddaughter to have something to do on a rainy day in Seattle! Remember doing this as a child and wanted to share the experience with my granddaughter. 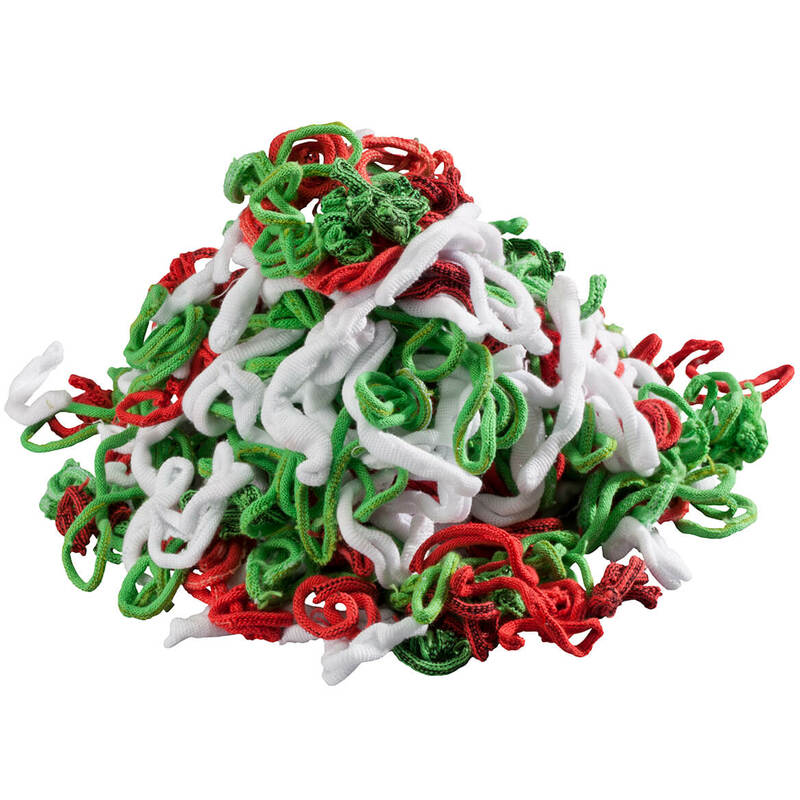 Holiday pot holder loops provide 10 oz. 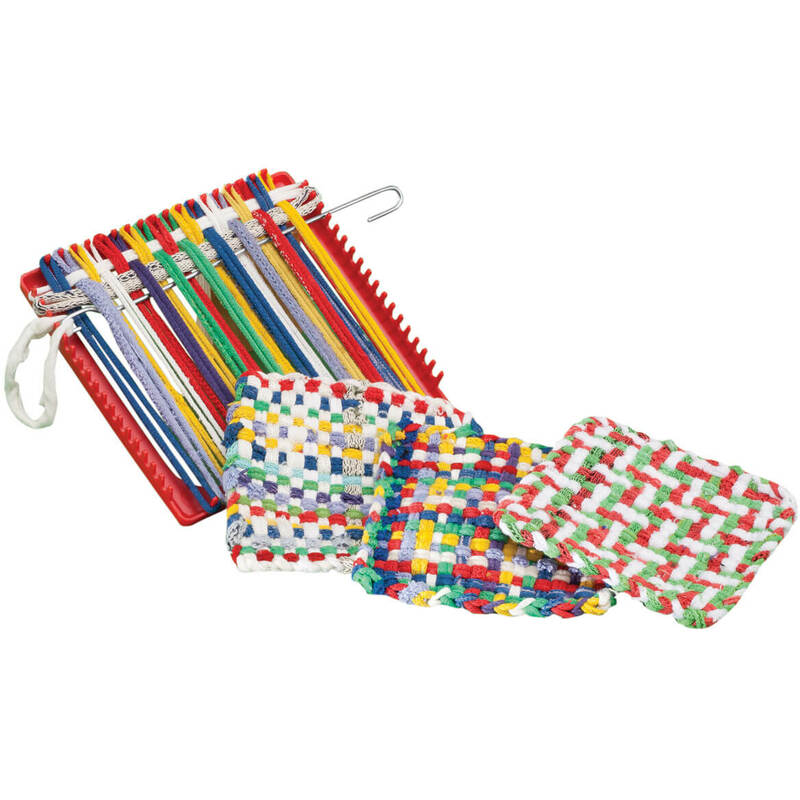 of red, white, and green cotton loops to create loom-woven pot holders.